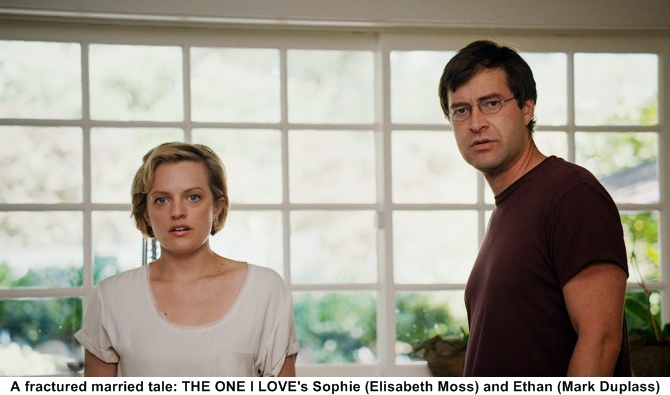 In The One I Love, Ethan (Mark Duplass) and Sophie (Elisabeth Moss) have reached a rough patch in their marriage. Their therapist (Ted Danson) suggests they try to reconnect during a weekend retreat at a gorgeous country house. There is much more to this wildly inventive romantic comedy than that, but the challenge in writing or talking about director Charlie McDowell’s sublime feature debut is to not give too much away. “It’s certainly tricky,” says Duplass. “It is such a good conversation piece, but at the end of the day, we have just discovered that you do better as a viewer of this movie when you don’t know what’s in there…We did this really cool test screening where we put 100 people in one theater on the left and 100 people on one theater on the right. People on the left knew everything about the movie that you would know from an average Hollywood trailer, lots of spoilers. People on the right went in blind, just with, ‘It’s a romantic comedy with Mark Duplass and Lizzie Moss. They go on a couples’ retreat to try to save their relationship. The One I Love was born out of Duplass and McDowell’s friendship and desire to make a movie together. Duplass furnished his pal with the kernel of an idea that McDowell and his writing partner (and the film’s eventual screenwriter) Justin Lader transformed into a 10-page outline fleshing out the story and characters. Moss, another friend of Duplass, was quickly recruited to play Sophie, and added her input into her character. Producer Mel Eslyn also contributed notes to the story. The project came together quickly. It was only six months from the time that McDowell and Duplass started talking about the movie until they were actually shooting it. McDowell says he is often asked what The One I Love‘s ending means, but the ending relates to everything that comes before it. With or without that which makes the film so unusual, it is the story of a relationship. McDowell points out that it is a romantic comedy that focuses on real people with real problems rather than the usual rom-com stereotypes and conventions. Still, Duplass notes, what the film is actually about only emerged in the making of it.